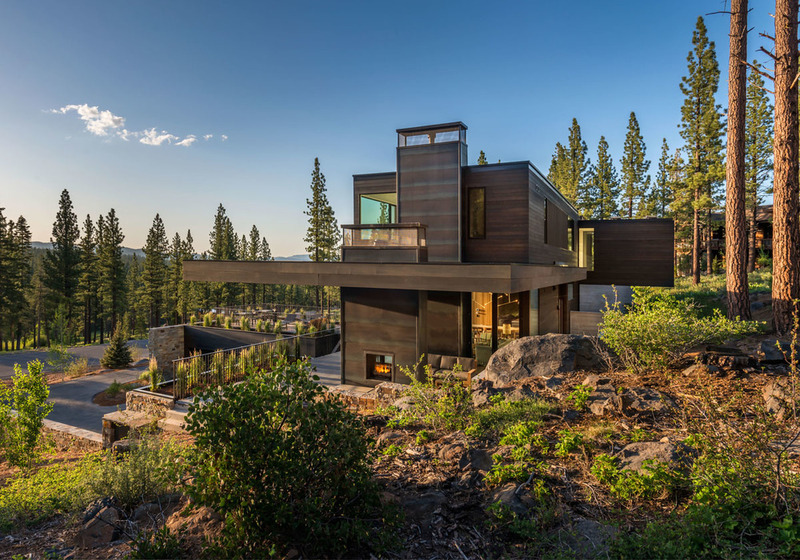 Brilliantly constructed to minimize its impact on its environment, this 6,379 square foot home for sale in Martis Camp represents a new standard in modern mountain living, featuring thoughtful design, sophisticated luxury, and undeniable convenience. Located on over one acre with majestic views of Northstar's Lookout Mountain, Big Rock Meadow, and the Sierra Nevada mountains, Custom Home 506 is thoughtfully constructed to minimize its impact on its environment, and blends seamlessly with the natural contours of its site and surroundings. The distinctive design of this home contemplates a simple ‘L’ shaped geometry, linking two wings with a dramatic double-height entryway. The open plan great room provides ample space for gracious entertaining, yet thoughtfully scales down the interior spaces, and offers warmth through the double-sided fireplace, and natural finishes such as oak and stone. Five en-suite bedrooms, including two master suites and a large bunk room boasting four full-sized bunk beds, easily accommodate large groups and unexpected guests. A generous playroom or home theater space leads to a grassy lawn; a home officeor yoga room with floor to ceiling windows is a private space for retreat or reflection. Two laundry rooms, an oversized mud room equipped with Henrybuilt's acclaimed Opencase system, and a dumb waiter represent this home’s thoughtful practicality, while its 1,000-bottle wine room, Control4 home automation, and radiant heat flooring represent its modern luxury. Embracing the great outdoors is easy in this epic home, which includes four generous outdoor living spaces, including a grassy lawn, a roof deck with panoramic views, a covered living area with a two-sided fireplace and a secluded hot tub, and a dining and a private lounge area with a barbecue grill.